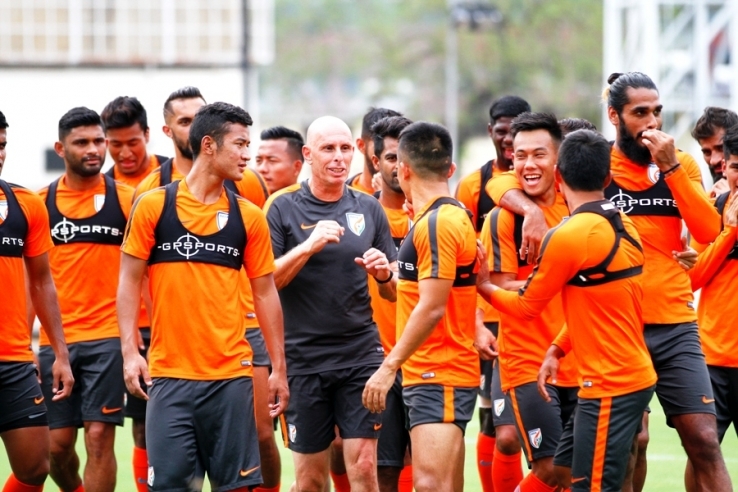 Stephen Constantine has announced list of 28 probables for the Team India's AFC Asian Cup Qualifier against Macau which is to be held in Bengaluru on 11th October 2017. While the probables list has 11 players from the Indian squad that featured in the AFC U-23 Qualifiers in Doha, Vineeth CK has been included in the team replacing Robin Singh. Defenders: Pritam Kotal, Lalruatthara, Nishu Kumar, Sandesh Jhingan, Anas Edathodika, Salam Ranjan Singh, Sarthak Golui, Jerry Lalrinzuala, Narayan Das. Midfielders: Jackichand Singh, Udanta Singh, Nikhil Poojary, Eugeneson Lyngdoh, Rowllin Borges, Md. Rafique, Anirudh Thapa, Germanpreet Singh, Halicharan Narzary. Forwards: Balwant Singh, Alen Deory, Jeje Lalpekhlua, Sunil Chhetri, Hitesh Sharma, CK Vineeth.